In India, a cricket crazy country, Cricket is nothing less than a religion. India being a country fragmented on parameters such as casts, creeds, borders, religions, and languages, Cricket unites the country’s demographic. It attracts millions of eyeballs, not just in India but across the world, making it an attractive advertising avenue for brands. However, in order to fulfill their advertising KPIs, it is important for brands to consider the mediums or platforms that are gaining the most popularity these days. With the audience’s changing viewing patterns, thanks to advances in technology, traditional mediums like Radio & Television are being replaced by digital platforms like video streaming platforms, OTT, and cricket portals are preferred instead. This holds true for rural as well as urban India. This has led to a steady increase in the traffic and viewing times of sports inventories, thereby providing brands a perfect way to increase their brand visibility online. However, it is crucial to spot the right audience from the deluge of viewers flocking these platforms. What’s even more crucial is reaching them at the right time and at the right place. 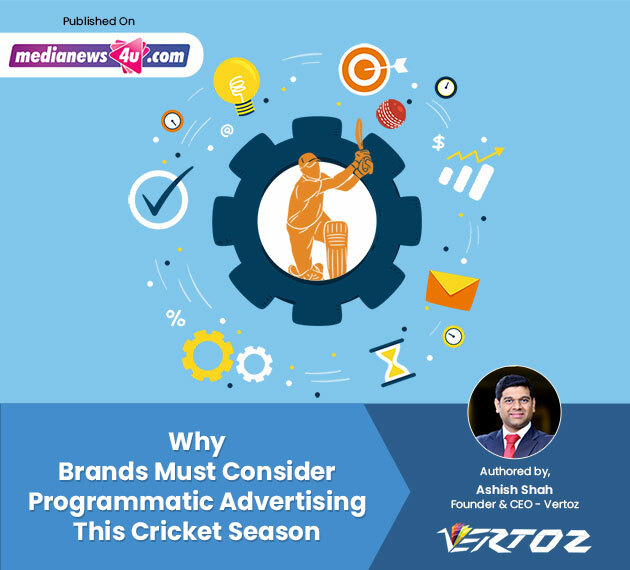 In a recent interview with MediaNews4U, Vertoz’s Founder & CEO, Ashish Shah talks on how programmatic advertising is the perfect solution to achieve this. Advertisers can leverage its precise targeting capabilities to reach out to their desired TGs. Viewers’ data such as their preferences, likes and dislikes, past browsing history and so on can be leveraged through Data Management Platforms (DMPs). From delivering personalized and highly relevant ads to eliminating the inefficiencies in ad spends, programmatic has it all. To know more on this, click here.